(28" chest) Boys Vintage 1970s Tuxedo Jacket! 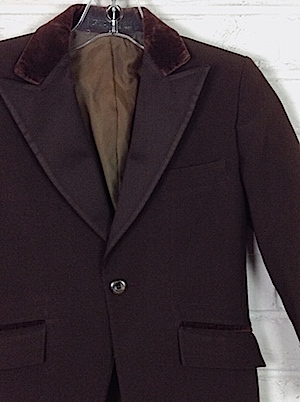 Brown with Satin Lapels & a Brown Collar! Home > Items just added 4/3-4/17 > (28" chest) Boys Vintage 1970s Tuxedo Jacket! 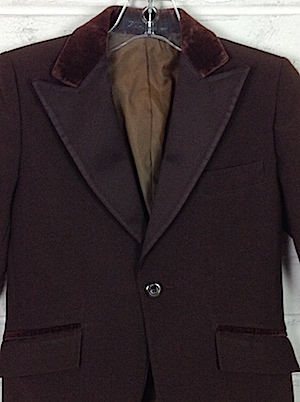 Brown with Satin Lapels & a Brown Collar! Boy's vintage 1970s polyester tuxedo. Marked size is vintage 10. The colour is nice dark chocolate brown. The camera flash blew out the colour a bit, so the lapels look lighter that they are. 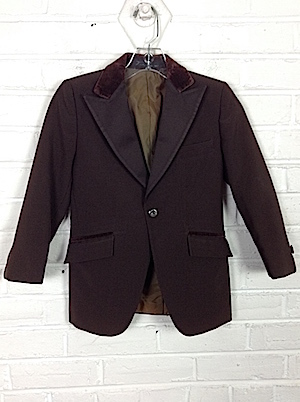 The body of the jacket is dark brown. The wide peaked lapels are slightly darker brown satin. The collar is dark brown VELVET! Over the pockets is a line of dark brown velvet trim as well. Closes with 1 pearly grey-brown button, and each sleeve has a swirly brown-grey decorative button. Center back vent. Made by Crystal Formal Wear. Condition: Very Good. Missing the right sleeve button. Old rental tux, so a slight bit of wear n'tear (a bit on the collar tips), but nothing major. Chest: 28" (photo is of a men's size jacket. This little fella's jacket is exactly the same style).